The 2018 Olympics are barely under way, and one world record has already been set: 1,218 Intel Shooting Star drones were used during the Opening Ceremony, earning a Guinness World Records title for the “most unmanned aerial vehicles airborne simultaneously.” The flight was prerecorded for the event. Intel set a world record with the use of 1,218 drones during the PyeongChang Opening Ceremony. 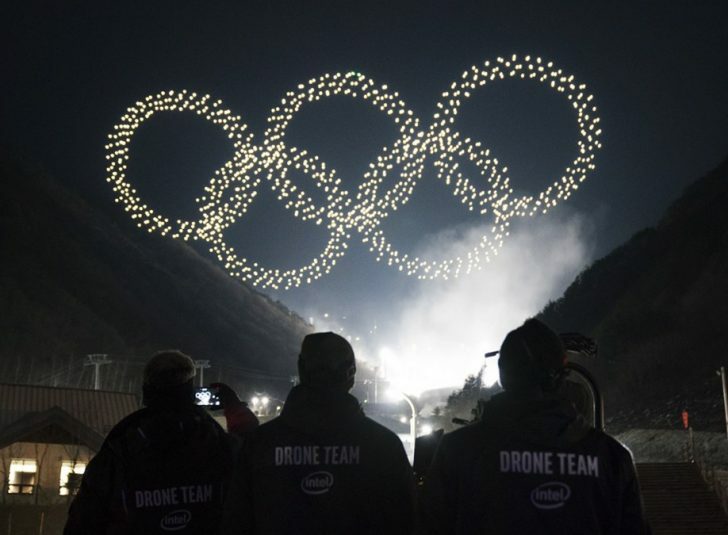 Kicking off the 2018 Olympic Winter Games in PyeongChang, South Korea, the Opening Ceremony treated viewers from around the globe to a light show that surpassed Intel’s previous record of 500 drones flown simultaneously in Germany in 2016. Intel designed and developed custom animations for the Opening Ceremony and nightly medal-ceremony performances, which include animations of different sports and various Olympics-related logos, including the iconic Olympic rings. The drones weigh only 33o grams and have a rotor diameter of 6 in. Built-in LED lights allow 4 billion color combinations. Following the Opening Ceremony, Intel ran a 30-second ad spot featuring the power of Intel Shooting Star drones and their entertainment possibilities. As a member of The Olympic Partner (TOP) worldwide sponsorship program, Intel is helping to transform the fan experience by creating immersive opportunities for viewers to be a part of the Olympic Games. The Intel Shooting Star drones are a type of unmanned aerial vehicle (UAV) specifically designed for entertainment purposes, equipped with LED lights that can create countless color combinations and be easily programmed for any animation. The fleet of drones is controlled by one pilot. For more of our coverage from the PyeongChang Winter Olympic Games, including interviews, videos, podcasts, and more, visit our SportsTech Live Blog.